Every Tuesday for the last month, American River College student Reneé Marie has been on campus encouraging folks to “glow gold,” the official color to bring awareness to childhood cancer. 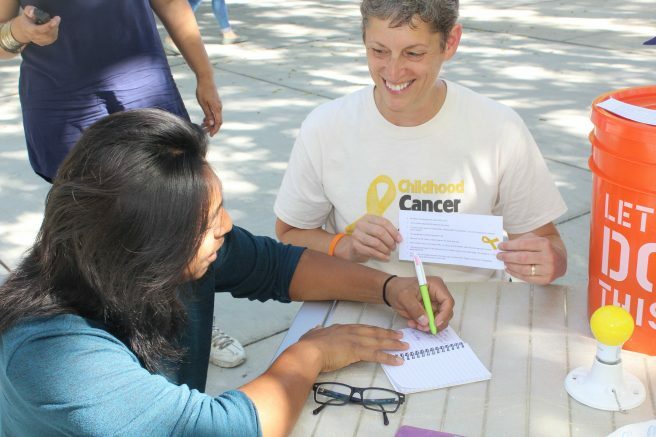 September is Childhood Cancer Awareness Month, and Marie, a Major in the Army Reserve, has come to campus armed with a little golden notebook, a smile and some somber facts on childhood cancer. The little golden book is filled with “love letters” that Marie has collected as she honors her nephew’s fight by bringing attention to this disease, that sometimes gets overlooked. The battle is personal. Her four-year-old nephew, Xander, just fought a victorious battle with neuroblastoma, the second most common cancer affecting children in the United States. “Childhood cancer is not rare. 42 Children (nationally) are diagnosed with cancer every day, so that’s not rare,” said Marie. According to Curesearch.org, approximately 15,700 children each year in the United States are diagnosed with cancer. Childhood cancer is an equal opportunity disease, affecting all ethnicities and socio-economic groups. Marie feels that talking to people one on one is the best way to bring attention to the struggles of families that a child with cancer and their families endure. The response from fellow students has been very loving and compassionate, according to Marie. ARC engineering student Omar Ramirez stopped by and read aloud the message he wrote to Xander in his little golden book. “Hey buddy, you’re a fighter, the miracle of life is truly a present, so have a great present and give it your all,” said Ramirez. One of the struggles faced are lack of funding for research and treatment for childhood cancers. This lack of funding results in adult treatment protocols being used to treat children, whose average age at diagnosis is 6 years. “…My little nephew, when he was going through his STEM cell transplant, his little eyes were bleeding. I only bring this up because if people don’t know the graphic details … they don’t have the sentiment to help raise awareness,” said Marie. Some of those late effects may include infertility, heart failure and secondary cancers. Marie would like to see the same energy and focus that has gone into breast cancer research be dedicated to eradicating childhood cancer. “October is breast cancer awareness month; we will see everything just flooded with pink with support…as it should be,” said Marie. “I am asking people to take September and ask our public officials to help “glow gold” our public buildings…you can tell people “I glow gold for September for Childhood Cancer Awareness,” said Marie. After several months of very toxic treatments, Xen is now N.E.D. which stands for No Evidence of Disease, and he will be honored at a victory party with his family on October 16. His Aunt Reneé will be right next to him, glowing in the gold. Be the first to comment on "Going for the gold to cure childhood cancer"